SeniorQuote can help you figure out which is right for you. The most popular Medicare supplement plan to date is Plan F. For one main reason: No Out-Of-Pocket costs. This will soon change though, and anyone insured with or considering Plan F should be aware. Another option, Plan G, provides the same convenient access and coverage with only one out-of-pocket cost. What exactly does Plan F cover? 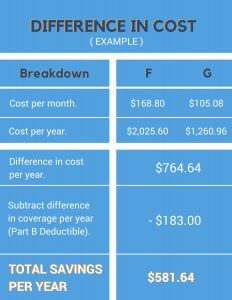 Plan F covers the Part B deductible, and Plan G does not. 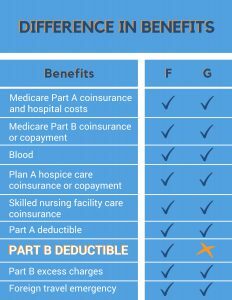 What this means for someone switching from Plan F to Plan G, is they will get the same access to providers, same coverage after Medicare pays 80%, same “ease of use” with exception to taking responsibility one other cost–the Medicare Part B deductible. Plan G costs less than Plan F. How much less, you wonder? It varies. For example, let’s take a 70-year old woman living in Austin, Texas. Amidst 10+ companies who offer Plan F in her area, she is currently paying $168.80 per month. On the other hand, Plan G is available to her for as low as $105.08 per month. We have helped several clients save annually by switching their Plan F to Plan G. To get a customized analysis like the example provided above, with actual, up-to-date rates, call 800-992-7734. To be contacted instead, please fill out our free quote form: click here. What is happening to Plan F? On April 16, 2015, the Medicare Access and CHIP Reauthorization Act of 2015 (MACRA) was passed by Congress and signed into law, changing the law on various aspects of health care, including some Medicare Supplement plans. The new law states that on or after January 1, 2020, a Medicare Supplement policy that provides coverage of the Part B deductible may not be sold or issued to a newly eligible Medicare beneficiary. This means that Medicare-eligible beneficiaries born after December 31, 1954 (turning 65 on December 31, 2019) will NOT be able to enroll in Medicare Supplement Plan F. Another less popular plan which also covers the Medicare Part B deductible–Medicare Supplement Plan C—will no longer be available as well. To view an actual copy of the MACRA law passed by Congress, click here. Plan F policyholders will be allowed to keep their existing policy even after the MACRA law is enforced. However, historical evidence shows that policyholders whose supplement plans were “discontinued” in the past experienced a drastic rise in premium cost after the discontinuation. Why? 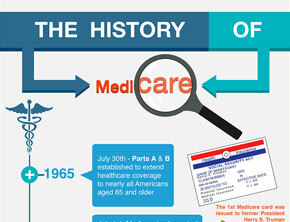 Let’s take a look at Medicare Supplement Plan J, which became unavailable for purchase in year 2011. Plan J was the only Medicare Supplement to include a benefit comparable to a Short-Term Care policy: the At-Home Recovery benefit, up to $1600 per year. Additionally, it provided a Preventative Care benefit up to $120 per year. Clients originally enrolled in Plan J after the discontinuation in 2011 experienced drastic rate increases. For instance, a 73-year-old man in California who paid $160.14 per month for his Plan J back in 2011 is now paying $377.60 per month today. The best way we can explain this is when a plan is discontinued, there are no longer any freshly 65-year-old people purchasing the plan. This means the pool of clients insured by the plan will only get older and older, causing the plan to spend more money on claims. In other words, the plan will not add on any healthier people, who contribute premiums to the pool of clients without making several claims. Ultimately, this can be confusing to most people. We invite you to speak with a licensed agent for further help in understanding the Plan F being phased out. Call us at 800-992-7724 or request a Free Quote to speak with a licensed agent.